Tim Cook is fond of saying that the great thing about Apple is that you can fit all of its products on one table. After today’s event, they’re going to have to get a bigger table. Apple(s AAPL) introduced a slew of new products on Tuesday, including three upgraded Macs. But most interesting was the expansion of the iOS lineup. Not only did we get a smaller iPad today with a 7.9-inch screen (as expected), but a brand new 9.7-inch iPad just a few months removed from its last major upgrade. To be sure, the improvements to the larger iPad are mostly internal: it has a faster A6X processor, a bump up from the A5 processor the third-generation iPad, and improved LTE radios that will make the device compatible with more carriers around the world. Combined with the new iPhone 5, and the new iPod touch and iPod nano introduced last month, Apple has a lineup of new iOS devices that are less than one month old heading into the crucial holiday shopping period. It’s easily Apple’s broadest, strongest iOS product line ever — and there’s no way it’s a coincidence. Because right now Apple is heading into a season of perhaps its most intense mobile competition yet. Though Apple still finds itself at the top of the tablet world, the competition is giving enthusiastic chase. Google(s GOOG) has a released a very well-received 7-inch tablet called the Nexus 7, although it’s unclear exactly how many have been sold, and Amazon(S AMZN) is about to release a revamped lineup of Amazon readers and tablets for this holiday. And Microsoft(s MSFT) later this week is going to introduce its first touchscreen tablet with new, integrated Windows software. Apple still has a huge lead: it revealed that it just sold its 100 millionth tablet in less than three years earlier this month, but the competition clearly isn’t sitting still. In smartphones, too, Apple has found a serious challenger in Samsung, which sells millions more smartphones every quarter. While Apple is never going to take the volume approach and release a new smartphone or tablet every few months like some of its competitors, it looks like the company is making good on its “price umbrella” philosophy when it comes to its broader mobile strategy — it’s not going to leave a lot of room for competitors to undercut it on price without sacrificing profit. Despite the tweaks, the price of the revamped larger iPad is the same: the fourth-generation iPad — or the iPad with Retina display, as Apple’s marketing materials are referring to it — still starts at $499. The 9.7-inch iPad, going into the holiday shopping period remains the highest-end iOS device, and when loaded up with the top specs, can go for as high as $829. 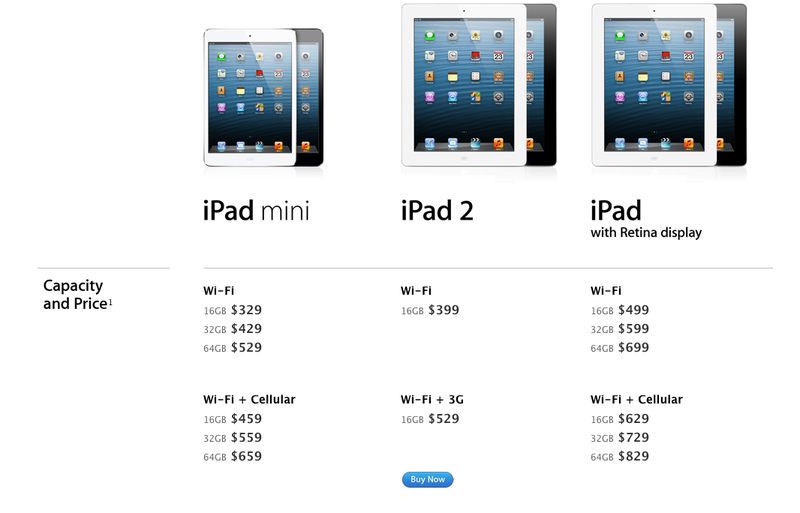 The iPad 2 occupies the $399 price point, and just below that is the iPad mini at $329. As far as tablets go, Apple made a statement today. For customers looking to buy a tablet this holiday, or next year, Apple will be offering something for anyone who’s looking to spend anywhere from $329 on up to $829, as the chart above shows. That’s a pretty big space to cover. Certainly $199 to $299 Android tablets exist and could be plenty attractive to customers uninterested in Apple’s brand or in spending a little more — but that’s probably why Apple spent so much time emphasizing how 7.9-inch screens offer 35 percent more real estate than 7.1-inch tablets. Apple’s move Tuesday forces Android competitors to compete against each other at the bottom of the market, whereas Apple can dominate the high end and middle (read: profitable) parts of the still-nascent tablet market. Time will tell how much volume those other companies can hope to capture. Is it TOO much? Apple prides itself on simplicity. Now, there are a ton of choices, and that could overwhelm customers similar to the way browsing the lineup of Sony TVs or HP printers is too much. Still, this will force a good amount of traffic into Apple’s still-expanding number of retail stores this holiday season. How far into next year is the lineup expected to carry us? Savvy customers know the iPad cycle; they’re released every March or so. Why did we just get a brand new device so soon after the third-generation device? It could be that Apple couldn’t justify selling a 9.7-inch iPad with an A5 processor right alongside an iPad mini with that same A5 processor, or it could be a desire to get the iPad onto the Lightning connector train. Either way, that helps them deal with the complexity issues: the fourth-generation iPad isn’t just bigger than the iPad Mini, it’s faster. What’s it going to mean for unit sales in the middle of the year? It also potentially introduces some more confusion for potential buyers. Has Apple shifted the upgrade cycle of the iPad for the foreseeable future to the fall, in the way that it has for the iPhone? It seems that way — it’s hard to see Apple being ready to introduce yet another new iPad next March. That could mean that people would wait to upgrade to a new iPhone until the fall, and they could also wait til fall or winter to buy a new iPad. It means one, possibly two quarters, where the company’s two flagship products see noticeable sales drops, or put another way, don’t get a big sales boost from a new product — as we saw in the third quarter of 2011 and the second quarter of this year. A holiday-oriented product cycle should be ultimately a good thing, because it means Apple won’t be going head to head with competitors every holiday with 7-month old iPads. But for now, it looks like having a great winter of sales could end up creating some havoc come earnings time in the summer. I think that if they were going to refresh the iPad to the lightning connector anyway, they figured they would up the ante by including an upgraded front camera and processor and making it a a new generation. This bump up in specs on the flagship iPad line will also help blunt the entrance of both the Microsoft Surface RT and the rumored super-resolution Nexus 10 by Samsung.